Finished size is 12in x 14in. FABRIC KIT AND BUTTON PACK AVAILABLE!!!!! A vintage red truck with Christmas gifts, holiday tree and decorations. 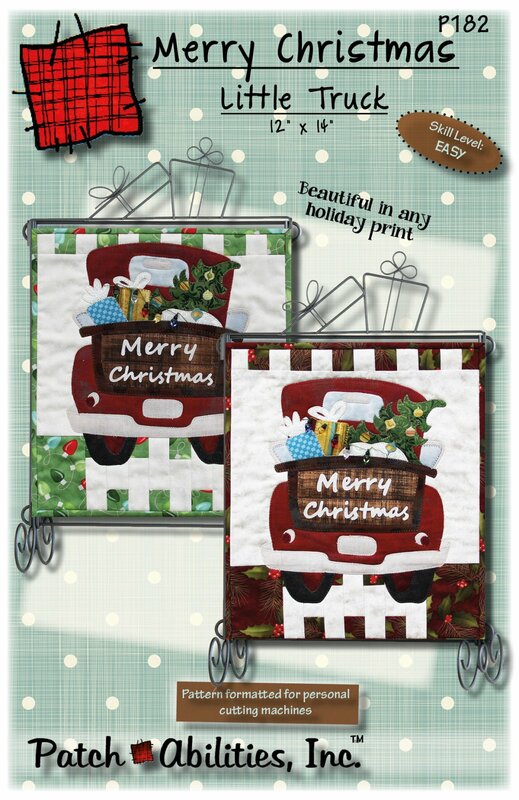 What could be more perfect for Christmas Holiday quilted wall decor. Pattern features: beginner friendly directions, traceable templates for fusible applique, full fusible layout guide so you don't have to guess where everything goes, and even includes beginner tips and binding instructions. Great beginner project to learn to machine applique with large simplified applique shapes. Just a little bit of embroidery and this can be completed in just 1 day. Ackfeld Wire Stand 89617 with Header 89430. Love the stand/hanger? Pattern comes with your choice of table stand and header (to display on a table, shelf, etc), or a 12" hanger for any wall.